I realize my blog posts dried up there for about ten days! Has it really been that long? I’m losing track of time and days, a hallmark sign of a good vacation. Thankfully the church bells of Benimeli give me a vague sense of the time, chiming out the hours, as my watch battery gave out on me on our third day in Spain. I took it as a sign to not get another one. We are now in Benimeli, a very small village of about 362 people, nestled in the Rectoria Valley, about thirty minutes drive time from the beach in Javea, just south of Valencia. It too is a quaint and beautiful Spanish village! I realize they’re every where now! Our rental house, El Sequer, and its view is pure storybook. The house itself is an old riu-rau, which once upon a time was a stone barn used for drying grapes and making raisins. It sits up against the mountain so has a view across the whole valley with the town falling down below. 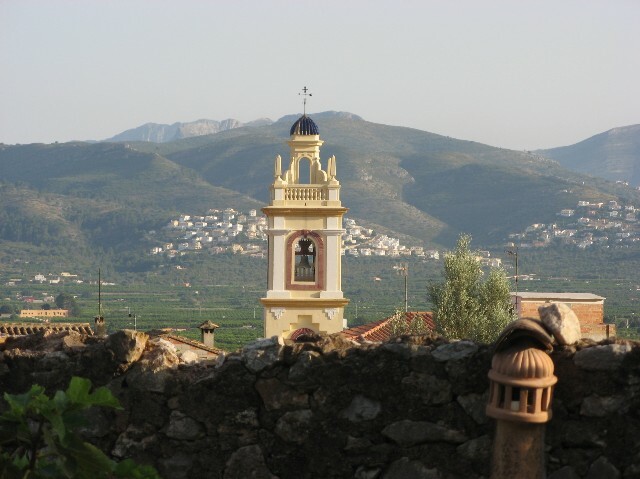 The church steeple in Benimeli pokes up into our view everyday, right over the stone fence, with the valley spread out behind. The church bell chimes the hour, twice actually, for those of us who don’t count correctly the first time. It’s one of my favorite things about this place. The house has been renovated with every detail in mind, and Jenny and Oswaldo have been wonderful hosts, letting us know where to find the best beaches and calling to remind us of the paella festival in the neighboring town of Denia. They had stocked the house with bread and beers, tea and hot cocoa for the morning, and the most wonderful honey and almond coca cake from Delores at the local bakery. We were surprised and a little distressed to not find a coffee pot that first morning. It turned up two days later, a crazy contraption that looks like one you’d take camping. It’s metal and screws all together and heats on the stove. Fortunately or not, it only makes about three tiny tiny cups of coffee so my morning coffee intake has been severely reduced. Most of our time the past ten days has been in moving/driving/settling to our new home here and scrambling around for more visa documents that the Spanish Consulate finally decided to ask us for. We applied for our visas in February; it’s now July. Welcome to our experience with Spanish paperwork! New friends we have met here told us it took them 18 months for their NIE card and 22 months to get their driver’s license. Well, we’ll be back in Boulder by then! Needless to say, we jumped at the consulate’s requests and spent our last days in Nerja finding a scanner to scan our FBI records and a translator to translate them. How one actually translates fingerprints is beyond me, but it seems to be status quo for those who work in that industry. New town also means finding new internet access. Luckily for us, we finally discovered that some official Department in Spain decided that the rural areas here needed a network so they too could have access. So every little town square has about 2 bars of wireless strength and once we figured out how to subscribe, we now can sit in Benimeli’s little church square and email away. Sending attachments and calling on Skype aren’t too reliable because of the weak signal, but we’re making some progress! Give us time! Ah, there go the church bells again! Must be time for morning coffee! It sounds like you are having a wonderful experience, learning new things, and seeing beautiful sights. I visited with uncle Don this evening and he says Kristi and Mary are reading and enjoying your travels. Janet and Richard are leaving for Mexico on Saturday, so my job will be to water the flower gardens for Janet. We are still cleaning apartments, but are getting there. I can’t remember who’s pot I cleaned mine or someone elses. Take care, Love and Kisses. Now that I’ve been in Spain for some eight weeks, I’ve learned that the crazy coffee pot at El Sequer is actually a Spanish espresso maker! Aahh, that’s why I only need one cup!